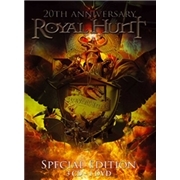 Danish/Swedish/American band ROYAL HUNT has been through so many changes. Founded by eternal keyboard player Andre Andersen in 1989 they have conceived eleven studio albums, four live albums and no less than six best of releases, primarily in Japan though. Vocalists like Henrik Brockmann, John West and Mark Boals have been in the fold, but only D.C Cooper have prevailed and returned. All in all nine musicians other than the present lineup of D.C Cooper, Andre Andersen, Jonas Larsen, guitars, Andreas Passmark, bass, and drummer Allan Sörensen have contributed. Many say that their peak was around “Moving Target” and “Paradox”, i.e. the mid nineties, while many want to forget all about their oddity “X” from 2010. What will this album represent?